Fun teppan table dining and a sushi bar highlight this Fullerton restaurant. : Chomp (and its sister restaurant Riptide Rockin' Sushi in Mission Viejo) is a more modern rendition of Benihana. 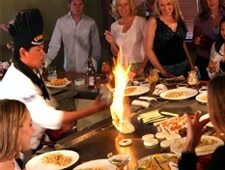 Diners sit at the teppan tables if they want to order the dramatic meat, seafood and rice dishes that are prepared on flat woks. Besides the drama, there is a selection of fresh and artistic classic sushi and signature fusion rolls. Chomp’s menu also includes soups, salads, tempuras and entrées of chicken, pork, beef and seafood. Robata offerings, Chinese fare and American steaks are available, too. A small amount of cocktails, sakés and wines is on hand to round out the meal. A special Champagne brunch menu is rolled out on Sundays featuring a mix of sushi and sashimi alongside various American breakfast favorites. A very reasonable all-you-can-eat sushi buffet is presented on Thursday evenings.